The rider will be judged on basic equitation skills and his or her ability to control the horse. To insure the safety of other riders, any OUT OF CONTROL HORSE WILL BE IMMEDIATELY EXCUSED. The judge must stop the class until the horse and rider have been assisted out of the ring. Academy Riders may only show in Academy Classes. They may NOT* return to the Academy Division after having shown in regular performance or equitation classes at any of these shows. *Exceptions can be made for adult riders that have had at least a ten-year break between showing in performance or equitation before returning to Academy. Students may not cross enter between walk/trot & walk/trot/canter divisions at the same show. Once they have shown in WTC, they may not returned to any WT division. Walk/trot/canter riders are to be judged both ways of the ring at these gaits. Classes will be split by age into English and Western classes. The horse must have earned/ be earning his living as a school horse for a MINIMUM of 6 months. The horse must be a mare or gelding and must have a full mane and tail. The horse may be any breed. School horses may be owned or leased by a rider as long as the above criteria is met. Open-type horses that are not regularly used as a school horse may NOT be used as Academy Mounts. Horse is to be tacked as if giving a lesson. Snaffle and Martingale is encouraged on young riders, full bridles are acceptable. Any leverage bit rein is PROHIBITED through the martingale. The saddle must be consistent with the style of riding. Horses must be neatly presented with clean coat and clipped bridlepath, face, ears, and legs. Hoof black is acceptable and encouraged. Prohibited tack includes: Overchecks, blinkers, or curb-bit or leverage reins through martingales in under-saddle classes. NO show packages! Shoe not to exceed 18 oz. with one pad and/or wedge for comfort of the horse. Show Farrier will make final decision. Shirts: Long sleeved, button down shirts with vest and a tie. Pants: To consist of jodhpurs. Footwear: To consist of paddock or jodhpur boots. Headgear: ASTM/SEI certified safety helmets are the ONLY acceptable headgear. Riders under 12 are REQUIRED to wear helmets. Older age riders are strongly encouraged to wear helmets, but this will be left up to the discretion of their parents and trainers. Hair: Must be neatly pulled back in a bun or braid as to not obstruct the view of the rider’s number. Gloves & Whips are optional. However, spurs are prohibited. No barn logos or identifying marks of any kind on any student or horse. ABSOLUTELY NO DERBIES, COWBOY HATS, CHAPS, HUNT OR SHOW COATS ARE ALLOWED. Students not complying with the above rules will simply not be judged, but will instead receive a participation ribbon (according to AHSA rules for illegal equipment). We must remember the purpose of these classes is to create an enjoyable and affordable division for the beginning rider. We also need to remember our ethics and follow the rules of these classes. 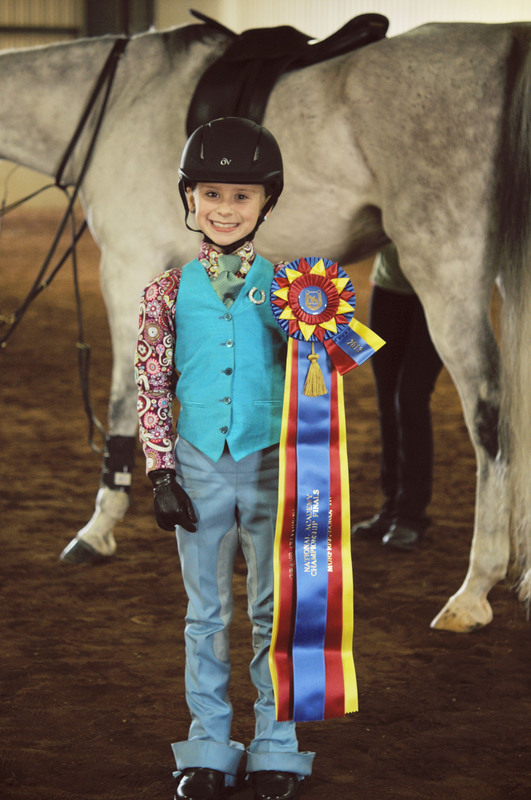 Every rider must qualify in a preliminary class in order to compete for a Championship class. The top 10 ribbon winners from each age group will move on to the Championship rounds. If a class has to be split, only the top 8 from each split will qualify for the Championships. Junior and Senior Finals will consist of the top 8 ribbon winners from each age group in their respective category. Ten ribbons will be awarded in the Grand Championship finals.